I was pleasantly surprised by the light, fresh taste of this dish, and of course, who can argue with dinner in under 15 minutes? 1. Heat the oil in a large skillet over medium-high heat. Add the onion and garlic and sauté for 2-3 minutes. Add the wine and let simmer until reduced. Add the shrimp and flip over after 2 minutes. 2. Add the parsley, oregano, tomatoes, vinegar, olives, capers and hot sauce. Bring to a simmer for 3 minutes or until shrimp are fully cooked. 3. Serve with a sprinkle of basil chiffonade. Ok, first and foremost skipped the black olives, capers and hot sauce. Mind you these items I don't mind but boyfriend, not so much. As for the capers - expensive. Enough said. Had the fresh parsley, but not the basil. Dried basil leaves works just as well. I always keep a bag of frozen cooked shrimp on hand. It cuts down on prep and cook time. 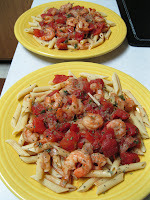 For this recipe, I add the shrimp when you're ready to let everything simmer - it will still absorb the flavors, trust me.